At Entasis we understand the responsibilities of fiduciaries charged with the oversight of investment assets. We have spent considerable time and resources developing our firm in a way that aligns with the needs of institutions and their fiduciaries. We believe our firm has many differentiating characteristics that are important to our institutional clients. Each of the firm’s founders has worked with institutions over the course of their careers. Our business model reflects those experiences. We are here to support the specific needs of small businesses, consultants, nonprofits, retirement plan administrators and growing, independent investment advisors. Just as many individuals are ignored by investment advisors and consultants with arbitrary minimums and high fees until unnecessarily high breakpoints are reached, so are institutions. 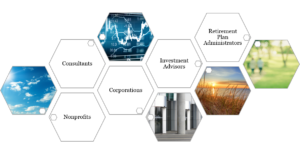 We are here to provide institutions with access to the institutional quality service they require as fiduciaries through our investment planning services, research and consulting services and investment management offerings. Contact us for additional information.